Whether chain-driven or bucket wheels, trenching machines provide powerful cutting capabilities for contractors to install pipe. 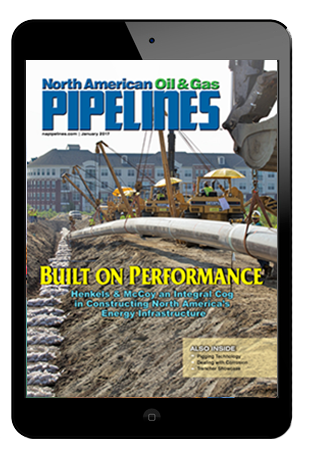 These behemoths cut up to 12 ft wide or more, and as deep as 36 ft to accommodate big-inch, cross country pipelines. 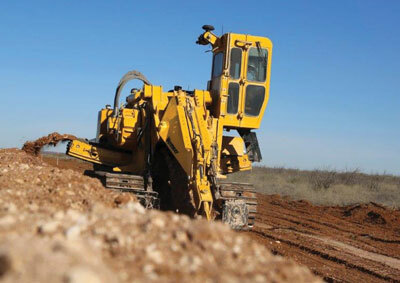 Trenching machines must absorb the pounding shocks day after day to maintain efficiency and uptime. About the Company: Eagle Trenchers offers the only full line of wheel trenchers on the market, with 10 models for pipeline, utility, foundation, canal, irrigation and drainage construction. Wheel trenchers provide the fastest method of excavation, leaving a perfect trench and spoil. Eagle’s trencher experience is unmatched in the industry, and Eagle Trenchers are the result, designed and manufactured in Ripon, California since 1988. 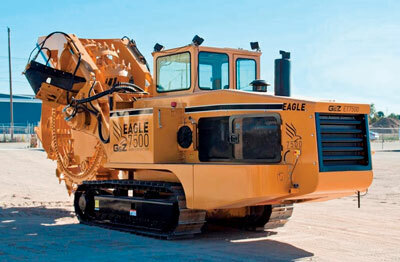 Eagles are heavy duty and well balanced, with all hydraulic drives, and mounted on tracks. They are built for reliable high production and low maintenance, incorporating the latest technology. About the Company: Talon Trenchers, a division of Two D Machine LLC, builds wheel trenchers with proven results in the field where it matters. Our operators have reported reduced fuel consumption, increased production, increased reliability and less down time. Meaning more money in the long run. The Talon 508 was developed and manufactured in the United States and is designed to withstand operating in all conditions. Talon Trenchers features a 500 hp Caterpillar C-15 engine, with the option of a 400 hp Caterpillar C-13, and are capable of trenching up to 8 ft deep with a width of 30 in. wide with the option of a 48-in. wide buckets. This trencher is completely customizable to meet your needs. Talon Trenchers offer superior service and support to all of our customers. The 508 is equipped an IFM PLC controller and operator interface which monitors track and wheel pressures to allow the operator the ability to get the most from the 508 without jeopardizing reliability. The cab offers climate control and has a swivel seat for operator comfort. 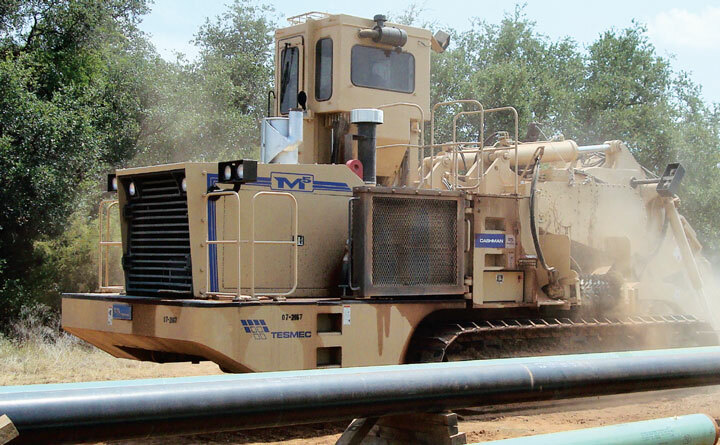 About the Company: Since its foundation in 1984, Tesmec USA Inc. has been building high performance trenchers to operate day in and day out under extreme condition. At its North America corporate headquarters in Alvarado, Texas, Tesmec is fully integrated in product design, fabrication and precision component machining, as well as the final product assembly and the quality inspection process. 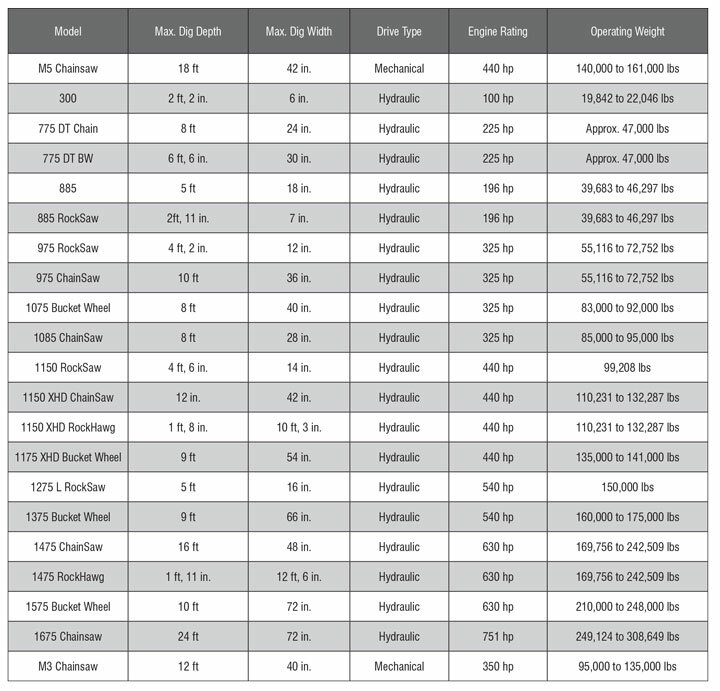 Tesmec produces some of the highest quality trenchers in the market today. Four different configurations are offered to meet the ever growing demands of today’s customers: Rocksaw, Chainsaw, Bucket Wheel and Rock Hawg. Tesmec offeres four different technologies to the pipeline construction market: Rocksaw, Chainsaw, Bucket and Rock Hawg. The company’s machines feature high performance gearboxes, top-quality engines and solid steel components. 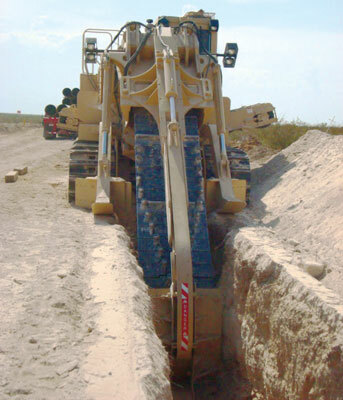 Tesmec trenchers come standard with Cat engines and are designed for all-weather conditions. 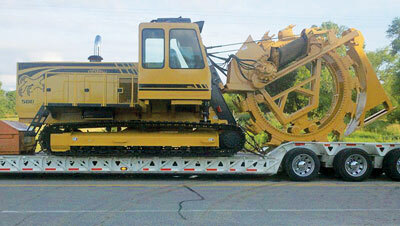 About the Company: Since 1945, Trencor’s large-scale trenchers have revolutionized the pipeline industry. Their rock-solid structure makes them the longest lasting underground equipment line in the world. Many active machines in the field today have logged more than 40,000 hours. Trencor machines are handcrafted in the United States by American Augers. About the Company: Founded in Pella, Iowa, with the invention of a mechanical hoist to help farmers unload grain, Vermeer serves customers in more than 60 countries with a full line of underground construction, surface mining, landscaping, tree care, environmental and agricultural equipment. Customers are at the core of the business, and they can expect reliable, local service and support from dealers in more than 60 nations. Learn more about Vermeer and its products, dealer network and financing options by visiting vermeer.com.